Kodak IM5 uses the iconic photo company's namesake, but it's far from the best camera to capture your picture-perfect moments and just feels cheap next to other budget phones. There's an older generation that still prefers to say they're capturing a "Kodak Moment" and wouldn't even know what "Instagram it" means, and for them there's the Kodak IM5. Kodak IM5 is an extremely simplistic Android smartphone from the rebounding photography brand and mobile device manufacturer Bullitt. It's nothing special, but that's the point. Its basic menus make it easy to use, there's an option to let a trusted friend or family member remotely take over the phone and it has a very mediocre 13-megapixel camera. It's far from the best smartphones that we have reviewed like the all-metal HTC One M8 and iPhone 6, but at $250 (€229, about £177) unlocked, it's meant for an entirely different user. There's not much to the Kodak IM5, and I knew that from the first moment I picked up this extremely lightweight smartphone at CES 2015. It was obvious that everything on the outside of this phone was plastic, except of course the 5-inch display that counted as high-definition, albeit just barely. The screen resolution was 720 x 1280, which was easy to spot after testing out the 1080p LG G Flex 2 and going all day using the 1440p Google Nexus 6. 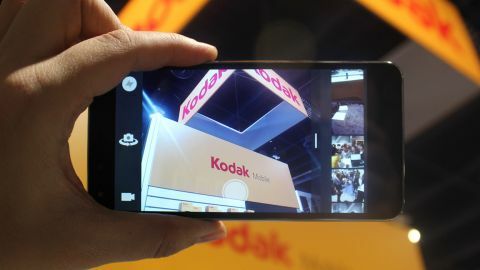 If you think that most first-time smartphone owners Kodak is entertaining with its low-end device aren't going to be counting individual pixels, you're right. However, my parents never complained about the upgrade to a Retina display and crisper text. When you think about it, that kind of stuff matters to them as much as you and me, but for different reasons. Kodak IM5 comes in two colors: white and black. It's certainly thicker than the phones we're used to testing out and I almost took its matte black backing for a case at first. It's not. No surprise, the plastic volume buttons on the right side of the phone are weak to press. At least there's a hidden gem on the left side: dual SIM card slots. That may not make it into the final US build, of course. Under all of the plastic there's a 1.7 GHz octa-core MediaTek processor, 1GB of RAM and 8GB of internal storage. A micro SD card slot allows for an extra 32GB of memory. The specs aren't much, though it shouldn't take a whole lot to power this fairly basic smartphone for the intended audience. The IM5 isn't the surprise Kodak snapper some have been anticipating. It has a 13-megapixel rear camera and a 5-megapixel front-facing camera, but the photo quality wasn't spectacular. Likewise, the default camera software doesn't offer anything outside of autofocus controls and basic editing and printing tools. You can snap "Kodak Moments" easily. Just don't expect iconic Kodak film quality from this entirely basic smartphone camera. The Eastman Kodak branding it bound to fool some people. Kodak's approach to its custom Android launcher is maximize the size of everything, from text to app tiles on the phone's single main menu. There's no "complicated" swiping to get to a second window of tiles. Twelve essential apps are always in the same spot on the home screen: Text, Contacts, Phone, Gmail, Camera, etc. Everything else tucked in an app drawer in the top right corner. Kodak IM5 has access to Google Play as well as a dedicated app store with hand-picked apps for its target audience. If the smartphone owner still can't figure all of this out, even with the incredible straightforward setup, they can ask a loved one for help via the phone's advanced remote management software. This menu allows trusted friends and family to pipe in from a PC or tablet and take over control of the device, sort of like LogMeIn. While I couldn't test this out at CES, it sounds promising given the direction of the phone. Kodak IM5 is slated to launch in Europe by the end of the first quarter of this year and then make its way to the US sometime after that. Is it going to be worth the wait? Well, it'll be priced at €229 in Europe, which means about £177 in the UK, and is expected to cost $250 in the US. There are a host of cheap Pay As You Go phones that are better contenders at a smaller price, and they're all available right now. Kodak IM5 is intended for a people who have been poorly served by handset manufacturers, according to the company. That's entirely true. However, it doesn't do much to help alleviate the problem. The single main menu interface with 12 big buttons is a good idea and the built-in remote assistance could be a lifesaver in certain circumstances. But the built quality is cheap, the screen is barely high resolution and the camera doesn't do the Kodak name justice. And, frankly, phones like the Moto G are better for a lower price.